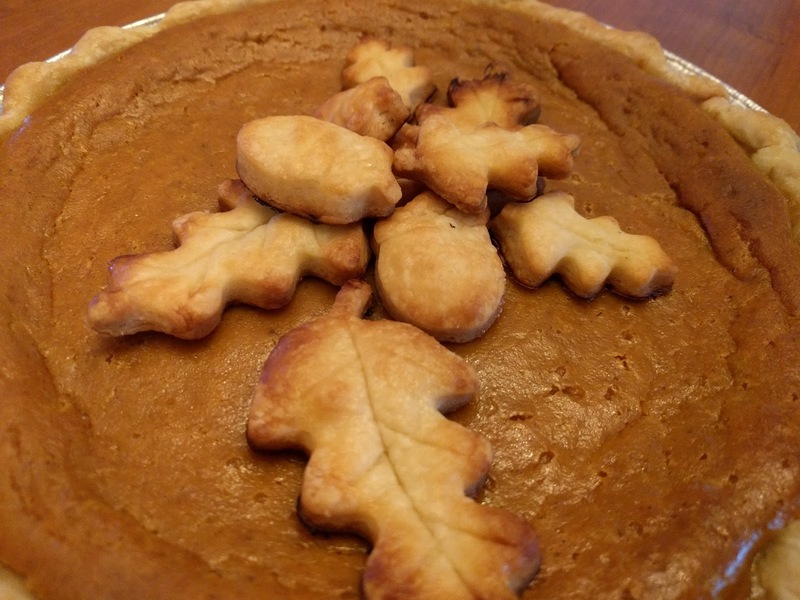 Today, well, starting yesterday, I made a pumpkin pie to enter in the fair's pumpkin pie cook-off. I made the eggnog from scratch yesterday and let it rest overnight. I made the pie crust with half butter and half leaf lard, and let that rest overnight as well. This morning I made the filling, using my favorite recipe with the eggnog and sweetened condensed milk. Then I suffered a series of technical difficulties. First, I had intended that the recipe would make two pies, with one being a back up in case something happened on the drive up. It didn't. It made one very nice pie and there was only a little left over. Since I had the crusts prepared for two pies, I pulled out some pumpkin purée from the freezer, added the rest of the eggnog I'd made, some spices, and some cornstarch, and made a second pie. Which, since the recipe was all over the place, I didn't bring as a back up. The next issue was that I made a lot of cute leaf and acorn cutouts to put around the pie. They took less time in the oven than anticipated and therefore most of them burned. Whoops. So I used what didn't burn and made a central design. Here's my pie. The second pie got baked and the last of the filling and the dough got made into little tiny pumpkin tarts in ramekins. Very cute. This afternoon the youngerchild had something to do so was dropped off two hours early, with homework. This enabled me to drive to Topsfield to get the pie in by 6 pm. My husband then made arrangements to get the youngerchild by 7 pm. The judging, which I'd hoped I could sit through, was closed to the public so I spent 3 hours wandering around the fair by myself. I watched the Mounties do their musical ride and teams of oxen pull progressively heavier weights - the last two teams were pulling 10,000 pounds. It's amazing. Then I went back for the pie announcement. Sadly, I did not win anything. I did get some feedback. They said the crust was cooked nicely but didn't have enough flavor (which I read as, "needs more butter") and the filling was "too spicy." Everyone has an image in their mind of how something should be. Apparently my image for pumpkin pie isn't the same as the judges'. That's okay, I like my pie the way it is. Well, WE like your pumpkin pie just the way it is, and chris makes a mean p.pie as well!! So there! Anyway, you did "salvage it, luckily!